This post originally appeared in the Pensacola News Journal, found here. • What the nominator said: To say Charlene Mauro is a doer is an understatement. She not only does, she makes a difference. She was my Pensacola State College marine biology adjunct professor, but she does so much for the community. Charlene is a locally and nationally recognized environmental educator who not only lives and breathes her passion for marine science education and conservation, but also ignites that passion in those she meets and works with. 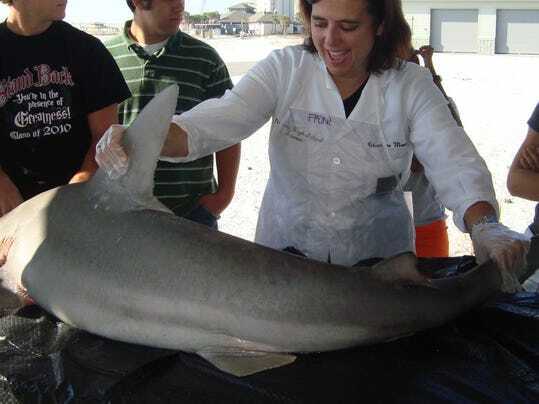 She has contributed a lot in the Navarre community, however, many of the students who attend school trips to the Navarre Beach Marine Science Station and summer camps are from Gulf Breeze and Pensacola. The station came with the incredible undertaking of hundreds of hours of grant writing and research on Charlene’s part, with the entire price tag of establishing the station on her shoulders. The county did not provide assistance for the start up of this adventure. She was so determined to create a place where the students were immersed in conservation through education. With funding procured and more than 2,000 community service hours later, the students, under Charlene’s supervision and guidance, had created what is now the Navarre Beach Marine Science Station. Since its official opening in August 2009, the station has been host to more than 5,000 students and community members annually for programs concerning the local marine environments.